ICYMI: CVS drugstores were booted from the pharmacy networks of Blue Cross and Blue Shield of Alabama. It's more evidence for preferred and limited pharmacy networks in commercial plans. But how many payers are adopting these new narrow network models? As far as I know, the only public answer comes from the Pharmacy Benefit Management Institute’s (PBMI) new 2016 Trends in Drug Benefit Design report. (Free download with registration.) Drug Channels again thanks Takeda Pharmaceuticals U.S.A. for having sponsored the research. 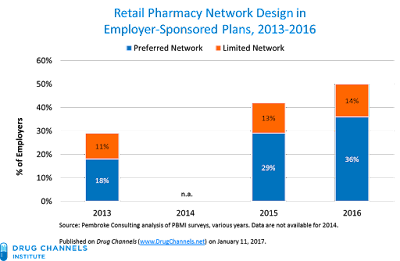 According to the PBMI’s survey data, almost half of all employers have a narrow pharmacy network. The chart below tracks the growth in different network designs. Many interrelated factors support the continued adoption of narrow networks. The savings to payers from narrow networks come primarily from pharmacies, which offer or must accept lower per-prescription margins. That’s what makes narrow networks so controversial—but also highly pro-competitive. Caveat venditor! The PBMI survey collects data from employers, not PBMs. The 2016 edition includes responses from 337 employers that offer prescription drug benefits, accounting for an estimated 12.3 million covered lives. The sample population of the PBMI survey is similar to that of the Kaiser/HRET survey that I discuss in Employer Pharmacy Benefits in 2016: More Specialty Drug Cost-Shifting Means More Problems for Patients. The PBMI research goes much deeper into plan design than the Kaiser/HRET report, but has a much smaller sample size. Just so you know, I was on the report’s Advisory Board, which meant that I was paid a small fee to review a pre-publication version of the completed research. Final responsibility for the report’s content rests with PBMI. For consumers with third-party insurance, pharmacy benefit managers (PBMs) assemble networks of pharmacies. 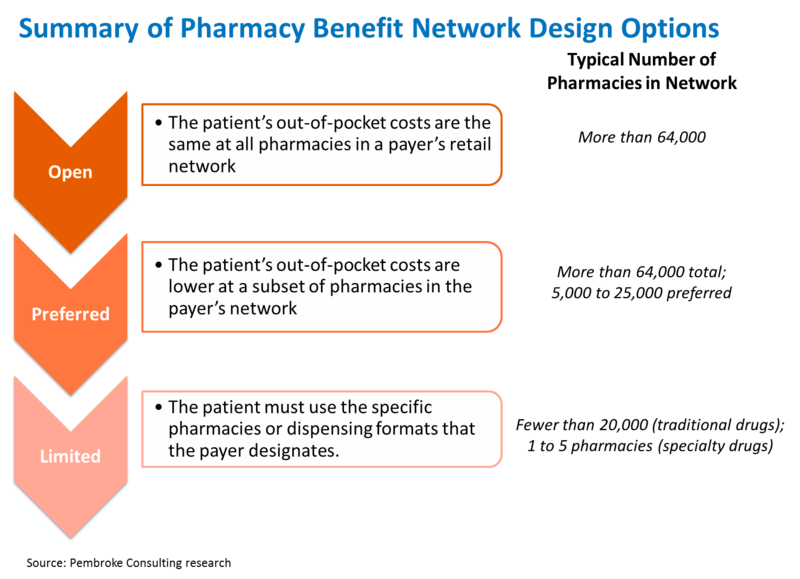 The chart below illustrates the concepts behind three basic pharmacy network models that a payer can select. In an open pharmacy network, a consumer’s out-of-pocket costs and copayments are identical regardless of which network pharmacy dispenses the prescription. Open networks remain the most common network design and include nearly all U.S. retail pharmacies. Pharmacies compete on service, convenience, and location to attract the consumers within a particular plan. Since the consumer’s out-of-pocket costs are identical at all pharmacies, there are no financial incentives for a consumer with third-party coverage to shop at the pharmacy with the lowest cost per prescription for the payer. A preferred network gives consumers a choice of pharmacy, while providing them with financial incentives to use the pharmacies that offer lower costs or greater control to the payer. A consumer with a preferred network benefit design retains the option of using any pharmacy in the network. However, the consumer’s out-of-pocket expenses will be higher at a non-preferred pharmacy. A limited pharmacy network (sometimes called a “restricted pharmacy network”) designates the particular pharmacies or dispensing formats available to a consumer. A limited network gives a payer the greatest degree of economic control over prescription fulfillment. 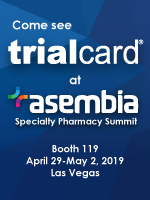 Payers will include only those pharmacies with the lowest costs of dispensing and/or the highest service levels. In exchange, the pharmacy becomes one of the selected members in the network and increases its market share. These models refer to network design established by a third-party payer or PBM. many pharmaceutical manufacturers adopt a limited dispensing network for their specialty drugs. 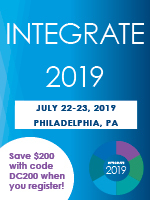 Such a manufacturer-defined network differs from these payer-defined networks, although the payer may further limit or manage a manufacturer’s network. Preferred network models have grown most rapidly within the Medicare Part D program, where CMS now calls them preferred cost sharing networks. About 85% of Medicare Part D regional prescription drug plans (PDP) have a preferred network. See Preferred Pharmacy Networks Are Back in 85% of the 2017 Medicare Part D Plans. Commercial plans are adopting narrow pharmacy networks more slowly than Medicare Part D plans. We speculate that commercial plan sponsors believe that there are bigger savings opportunities and less beneficiary disruption in areas with less beneficiary disruption, such as higher cost-sharing requirements. The chart below, created from various editions of the PBMI report, provides the only public data on the prevalence and utilization of these plans outside of the Part D program. For 2016, almost half of employers report using a narrow pharmacy network: 36% have a preferred network and a further 14% have a limited network. By contrast, only 29% used narrow networks in 2013. Most of the growth has come from preferred networks. The major drugstore chains are now active participants in narrow network plans. CVS Health’s Maintenance Choice program is the most prominent limited network model for commercial plan sponsors. (See CVS Drugstore Profits Suffer as Walgreens Partners.) For 2016, 25 million covered lives were enrolled in the program, up from 23 million in 2015. That equates to 31% of CVS Health’s 80 million total lives under management. Walgreens has become the preferred national pharmacy chain for partnered with just about every PBM not named Caremark. See Walgreens’ TRICARE Win: Tracking WBA’s Aggressive Preferred Network Deal Strategy. I’ll have much more to say about the impact of narrow networks for pharmacy economics in my forthcoming 2017 Economic Report on U.S. Pharmacies and Pharmacy Benefit Managers. Until then, remember William Gibson's famous observation: The future is already here—it's just not very evenly distributed.